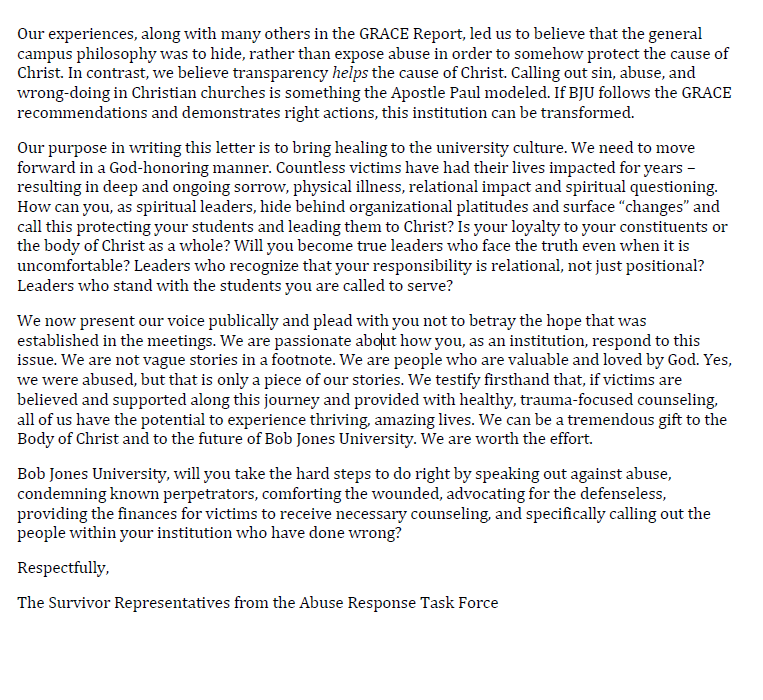 The letter posted below was written by the two abuse survivors on the Abuse Response Task Force, and them alone. It is not authored by the one member of GRACE or the two representatives of BJU, but only the two abuse survivors who were on the Abuse Response Task Force. BJU needs to stop seeing itself as a leader for Christ, but a follower of Christ. That includes confession of its sin. They know their sin, and by trying to hide what can’t be hidden, they make faith a sham. 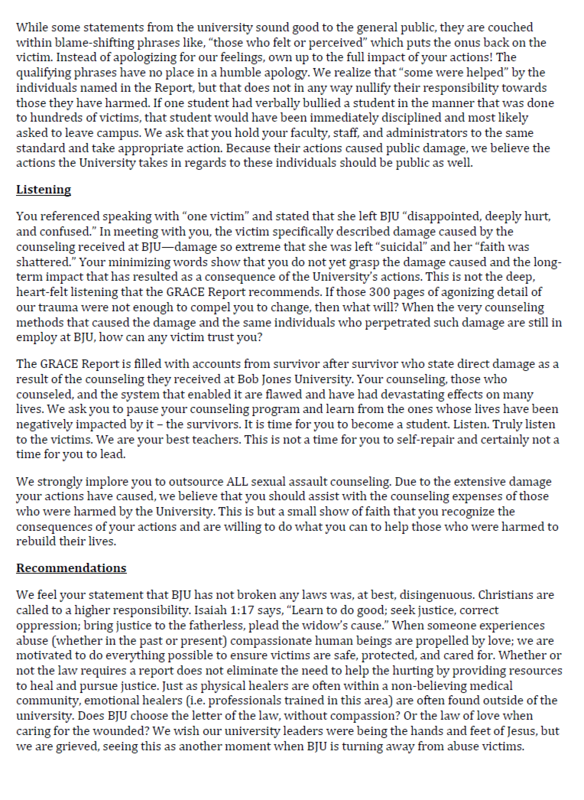 I am deeply grieved for those who have been abused at the hands of BJU. At the time the GRACE report came out, this author predicted that no substantial change (if any) would ever come of it. It is unfortunate that in the past 15 months he has been proven to be right. Abuse is going to continue to happen (and victims will not find justice and healing) until people begin to acknowledge that this sort of behavior is driven by the faulty theology. A year since the last public response, and still so little to show for it. It’s also been just over a year since a friend asked me to consider writing down my own thoughts about the University’s response. I am thankful that the University has set in place new guidelines for reporting abuse. But, the nouthetic counseling that is still being practiced there is not sufficient for the needs of those who are dealing with the lingering effects of trauma. There is much research available about the ways in which trauma affects the brain, and based on that knowledge, there are therapies available that can help with the flashbacks, nightmares and other residual effects of trauma. There is hope!!!! The University prides itself on the advances it has made in its Science Department. I hope that some who are in a decision-making position at the University will be willing to investigate the biological roots of PTSD and other mental illnesses. All truth is God’s truth, and psychology is no exception. Though we may not always understand the complexities of the human brain, that does not mean that PTSD, depression, and anxiety are spiritual problems. There are biological factors that must be acknowledged as part of finding help and healing. The University has an opportunity to help young men and women find peace and freedom if they will be willing to outsource counseling for those who need to find healing from trauma. Instead of adding to their struggles, the University can give these survivors a gift if they are willing to research and learn from current scientific research! I continue to pray for change. 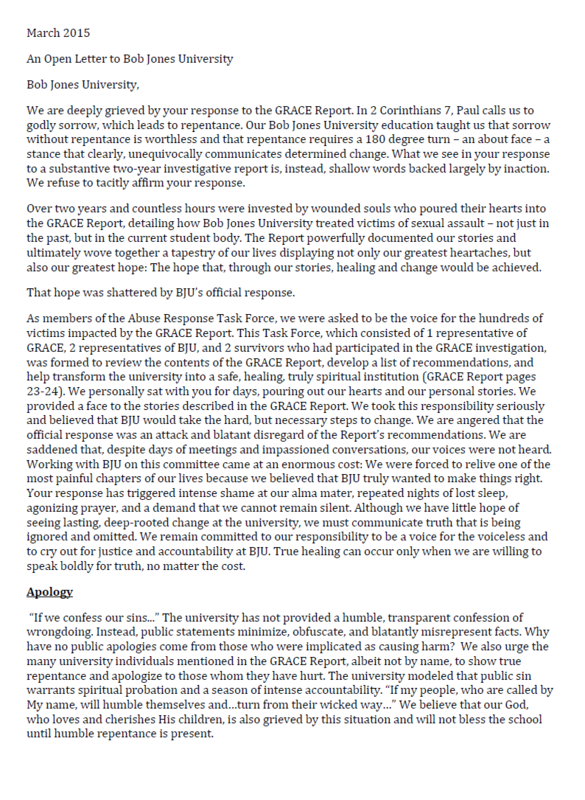 5 Pings/Trackbacks for "An open letter to Bob Jones University from the survivors of the Abuse Response Task Force"